Hanne & I at the Dom Cathedral in Köln. 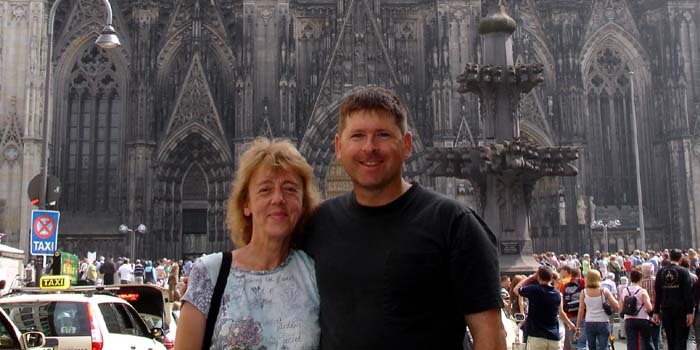 We were trying to figure out what to do one weekend, when I discovered that Hanne had not been to Köln since she was a child. For this reason, and the fact that it was only a short three-hour drive from Idar, we decided that it would make a perfect one-day trip. After finding a spot in a parking garage in the Neumarkt section of the city, we started our trek to the Kölner Dom Cathedral. We did a bit shopping and my stomach started to gnaw on me. So, I bought some currywurst with pommes fritz, and we settled down to watch a Reggae singer perform. He was pretty good, although his Haitian accent was quite thick. As we continued toward the cathedral through the shopping district, it suddenly appeared, towering above the buildings nearby. We decided to walk around the shopping area so that we could get a front-on look at the gothic structure. All about the grounds of the cathedral were street performers and painters, of whom I was able to capture a few in the photos below. These performers helped to provide a festive atmosphere. 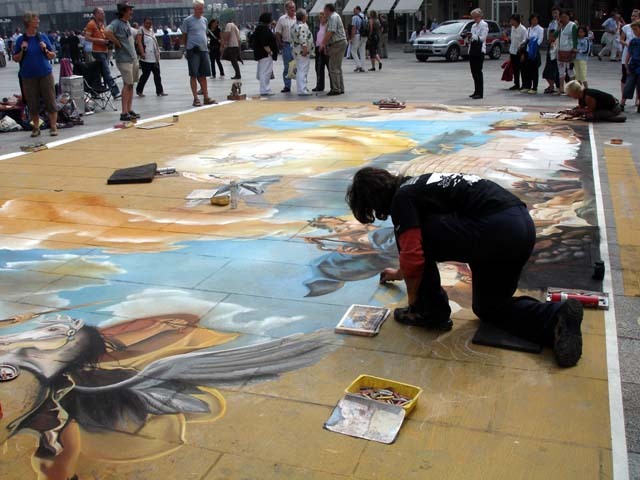 Artists painting near the cathedral. 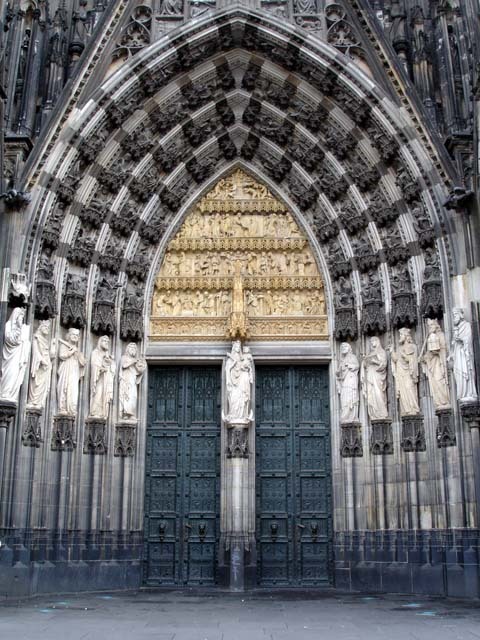 Main entrance to the Dom Cathedral. The Dom Cathedral is an amazing example of gothic architecture which took over 600 years to complete, and cannot be truly appreciated unless you see it in person. It's also amazing that it still stands today, because most of Köln was leveled due to allied bombing during World War II. Thankfully, this world treasure survived the impact of 14 bombs, and is a testament to its builders. The cathedral is also home to the remains of the Three Wise Men and the Jeweled Madonna. Many beautiful works of ecclisiastic art are also available for viewing. 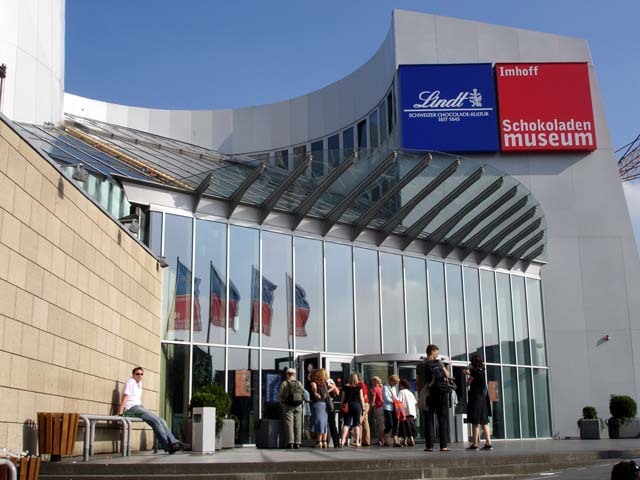 Next stop, the Schokoladen Museum. We were thirsty after our walk to the museum, so we stopped for drinks before entering. Hanne had a Drecksack (dirty sack - cola and kölsch) and I had a kölsch. They don't sell beer in Köln - only kölsch (ssshhhh - its the same thing but don't tell them). Once inside the museum, we were immersed in the history, cultivation, and processing of the cocoa bean. On display you can see old equipment, what a chocolate store looked like 100 years ago, and even a working factory which produces the chocolates found in the gift shop. Entrance to the Schokoladen Museum.